When I started turning in the autumn of 2003, a year and a half prior to retiring from the US Navy, my 'plan' was to take a year off and combine my passion for fishing and dabbling interest in woodturning since junior high school wood shop to make wooden fishing reels - modernised depression-era Sidewinders - from exotic hardwoods. After getting a lathe of my own and finally having the the time and resources to pursue woodturning, a new Woodcraft store opened nearby. I serendipitously learned about burls and that there were many areas of woodturning I never knew existed, specifically, turning hollow forms. By the time I retired in June 2005, I was turning large winged bowls and hollow forms and importing Australian burls. My interest quickly morphed into obsession and I began working to build a successful home business and woodturning career. During the autumn of 2008, people stopped spending and I had a hard time myself justifying spending a lot of money myself turning a large, expensive burl with the ever-present risk of failure. The financial crisis of 2008 and its aftermath forced me to consider more efficient and conservative use of my burl supply from both a woodturning and sales perspective. I started turning smaller, something I could rationalise and justify more easily, and found that I really enjoyed the challenge of seeing just how small I could turn while adhering to the same standard of quality, developing my own tools in the process. Instead of viewing burls in terms of producing a single finished product, I began to look at maximising their usage, seeing many pieces I could produce from a single small burl. 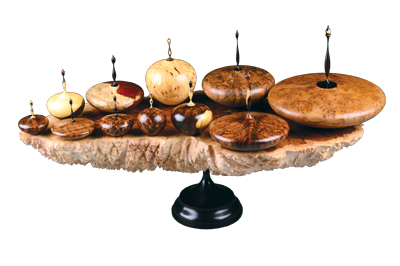 And because as a burl business owner I could not select all the mostly aesthetically appealing burls for my own use and maintain credibility with my customers, I specifically selected burls that were unappealing or had not sold for whatever reason. This was a blessing in disguise, because by cutting the unappealing shaped burls into smaller chunks for hollow forms I could effectively achieve the heartwood/sapwood contrast that really appeals to me. As I further tested my limits, I began turning from scrap burl or cutoffs, pieces I previously would have likely discarded. In fact, 9 of the 11 pieces pictured are from scrap stock. But displaying small pieces was problematic until I thought one day about a comment a customer made about making burl shelves, and I adapted that comment to my need for an effective display. I experimented with small burls and oblong burls that don't sell easily, mounted on an African blackwood (Dalbergia melanoxylon) base to display multiple small and miniature vessels. I start by roughing out pieces - attached by epoxy gel to a waste block mounted on a 55mm faceplate - as quickly as I can, with only minimal effort to shape, including rough hollowing. It's rare that I spend more than 30 minutes on a piece at this stage. After roughing out a dozen or so pieces, I place them in a homemade kiln for at least 30 days before final turning and final hollowing. Then comes the challenge of developing a complementary finial and shaping it to match the contour and proportions of the vessel. When I'm not turning a piece with natural sapwood contrast like the largest one on the display, I usually try to achieve contrasting interest in the finial to complement the vessel.